Watershed was recently sent some information about the John Henry Newman Institute of Liturgical Music. We have shared it below. The programme for following months will be on the website by January 10th 2013. Since its launch in September 2011, the first year has been both busy and complex. The immediate tasks have been to provide a relevant and inspiring programme of events, to investigate the extent and nature of musical needs to be met, and, of course, to remain solvent! With these aims in mind, the Director has travelled and worked widely at home and abroad, teaching, singing and meeting like-minded people so that the Institute’s work is well-informed, purposeful and practical and also involves active and enthused people to further its cause. There has been a series of practical and theoretical talks based in Birmingham, and events in other parts of the United Kingdom such as Glasgow, Cambridge and Cardiff. In September this year, a successful conference was held in Birmingham at the Oratory church and the Oratory primary school in Ladywood and this confirmed the purpose of the Institute and the need for its work. The videos of the lectures are on our website. 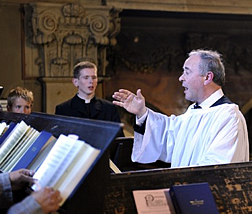 With these elements in mind, practical, supportive and academic, we will work hard to establish a high quality knowledge and skills base to support liturgical music. Probably, to end this letter, it is best to restate the purpose of liturgical music which can be difficult to explain in a few words, especially to the impatient and unimpressed! This is part of Fr Guy Nicholls’ opening address from our September conference. There is much work to be done and we will do our best to keep you informed. We send you very best wishes for the Christmas Season and hope to hear from you in what will, no doubt be a very busy 2013. To learn more, you may want to visit their website [url]. There is also an Email address listed that can be used to reply to the Questionnaire (John Henry Newman Institute of Liturgical Music) [pdf].